Success of Parent Org: Thank you for all you do; what a great auction and other fund- and fun-raisers this year; you are awesome! Goals: We’ve set robust goals in the areas of: curriculum review; technology; reading; use of student academic performance data; and religion curriculum and assessment. Several of these goals focus on creating systems that will ensure that we are thorough in researching, implementing, and conducting ongoing review and analysis – for example in an ongoing cycle of curriculum review. In the area of reading, we want to ensure the academic success of every student, through extending strong support through the intermediate grades and middle school. In analyzing our reading scores, we recognized that a majority of our students perform in the top quartile, and we’re identifying strategies to ensure that they stay there and meet their ongoing growth goals. Our technology goal will focus on curriculum-driven technology decisions. Surveys: Through our surveys, it was clear that academic excellence and Catholic values are the top reasons for families choosing OLG. Satisfaction with the school was very high overall in these and other areas, including community, staff, and size. In identifying priorities and values, STEM subjects came up multiple times. The staff and School Commission have discussed this extensively and are committed to ensuring that OLG stays strong in these area and keeps growing. We’re excited about the launch of after-school robotics and the intermediate grade robotics offered this spring, as well as our real-world environmental education opportunities. We plan to bring robotics down to the primary grades as well! Our FOSS science program is strong and engaging, and middle school students tie science learning to service and Catholic Social Teaching. The adoption of Math in Focus for K-5 this year has caused us all to stretch, and yet the staff is excited about our students’ ability to articulate math concepts and processes and defend their thinking – and to confidently and competently solve challenging mathematical problems. Susan Sutton, 6-8 math specialist, and I attended informational sessions for the middle school program that is an extension of Math in Focus. The rep told us that their middle school program does not include algebra, and he actually felt that the program we currently use in middle school is challenging and cohesive with Math in Focus and that the transition should be smooth, if we decide to stay with it. We’re still researching and also looking at how we can best use available funds to continue to add enrichment and support throughout the grades, as we gain familiarity with our new curriculum. That process will continue next year. In terms of STEM, we’re also excited about the way technology is used throughout the curriculum, our middle school science fair, some of the coding that is taking place in classrooms, and the training we received this fall in bringing solar energy lessons into the classroom. And…we love that our students get a deep grounding in the Catholic faith and in service, the importance of the arts in our curriculum, and the very strong reading and writing skills that our students have when they graduate – as important in the sciences as in any field, with the demands of reading technical content and writing research articles. As one staff member said, “We teach the STEM processes, and we are so much more than a STEM school.” OLG will also be hosting a STEM teacher training here for the Archdiocese on March 20th. Extra-curricular Programs: After school programs launched this year, and we’re looking forward to expanding! This year’s offerings have been well-attended and successful – robotics, drama, singing, tennis, and healthy cooking. Others will start this spring: percussion, fashion design, Girls Rock Math, Glee Struck…A separate email will be sent regarding summer program options for students entering grades K-6 during the weeks of July 6th and July 13th. Other achievements: library upgrade; WiFi for the gym in process this week; Math in Focus in K-5; OLG teacher leadership on Archdiocesan curriculum committees; funds raised at the auction to begin window upgrade; accomplishment/significant progress toward nearly all Five Year Plan goals; and much more! Lunch Program: A committee is forming to explore the best way to ensure healthy, nutritious lunch options that are students are excited about! Thank you for your survey feedback to guide this committee’s planning. Some of the “angel donors” who’ve helped OLG for the past few years through the Fulcrum Foundation have seen our school grow and flourish…and now they’re helping some other schools in the Archdiocese with more urgent needs. This, along with the death of some major donors in recent years means a loss of generous support. We’re confident we can find other donors to fill in but can’t count on that for this year’s budget. This has been a big year of changes to systems within the Archdiocese. While the Archdiocese feels that these changes will improve efficiency and provide long-term cost stabilization, there is a significant initial cost impact to schools and parishes, including a new payroll system that will increase OLG’s processing fees to nearly eight times the cost of the previous system. The Archdiocesan insurance policies have changed as well, which has raised our share of that cost for 2015-16by one and a half times more than our previous payments. The actual 2015-16 cost to OLG for the new systems was provided in late January, right in the middle of our budgeting process. This was our stretch year to incorporate the new gym costs into our budget. We’ve done a good job, and the gym brings tremendous value and opportunities to our students. However, as we have lived into it, we’ve realized that our expanding facilities have brought increasing maintenance needs, and our costs in that area have increased a little more than anticipated. We do feel that we have a great team in place to maintain our facilities and ensure that they are safe, clean, and in good repair for our students! It’s unfortunate these changes are happening all at once, and please know that everyone in the parish and school are stretching to make things work this year. Due to these challenges, tuition will increase by 8.5% for 2015-2016. For more information or conversation about this, feel free to contact me. We have an amazing school, a fantastic community of families, staff and parishioners, and some really exciting teaching and learning evident in our classrooms each and every day (see below for Classroom News and photos!). This community has high aspirations for the educational program at OLG and has come together to make dreams a reality in ensuring that our students have not only an excellent academic program and strong foundation in the Catholic faith, but also a school counselor on site (See Heidi Ehrenberg’s article below), a strong arts program, a wonderful new gym that is constantly in use, technology infused throughout the curriculum, a service program that is unparalleled, and much more. Our teachers are creative and innovative in fostering the development of joyful, life-long learners. Thank you for your investment in continuing to make OLG a truly wonderful place for children to learn and grow. 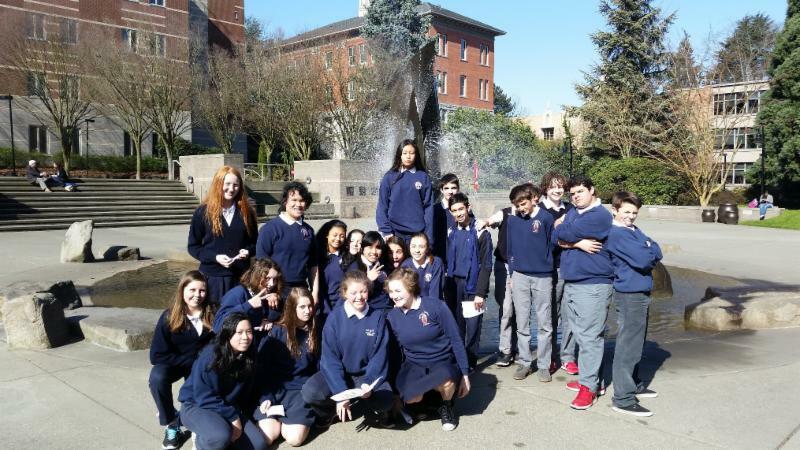 OLG’s eighth grade visited Seattle University as an opportunity to bridge our students to the college world via the theme of service learning and poverty education. We were privileged to listen to Ben Curtis, the Director of SU’s Poverty Education Center. He edified us with a presentation on his personal experiences in developing nations, showing and describing scenes from places including Mumbai and Zambia. We also heard from a Service Learning professor and student who engaged us in an activity that helped us define our personal meaning of service. Afterwards, we toured the SU campus, giving students exposure to a college atmosphere. Finally, we took part in small group discussions with students of SU’s teacher-ed program. Our 8th graders were able to share about their Juan Diego Projects, and they left a positive impression on these future teachers. I felt privileged to take my students to my alma mater and give them a glimpse of the social justice education that I received as an undergrad and grad student. We’ll be reflecting on what we’ve learned in the coming days; until then, please ask an 8th grader about their experience when you get a chance! How much mass can a beetle pull? 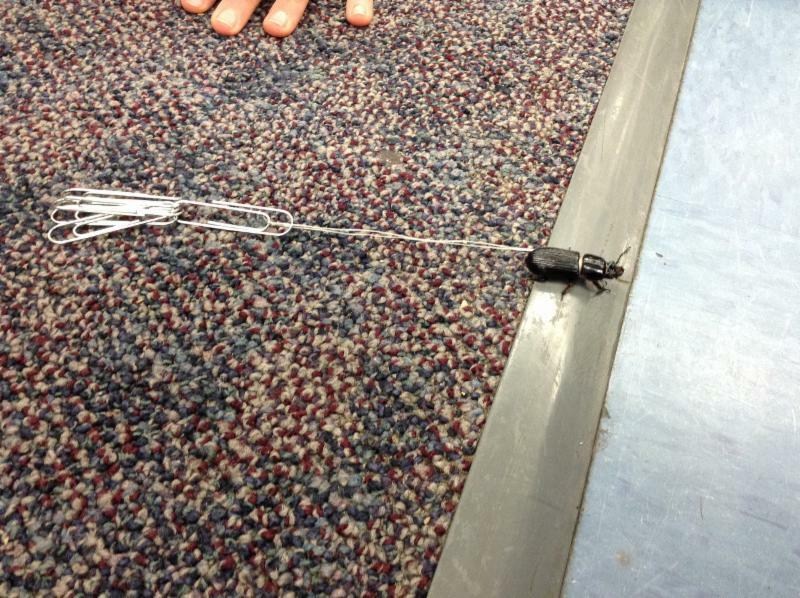 Students attached paperclips to the beetles using a harness and let their beetles show their strength! 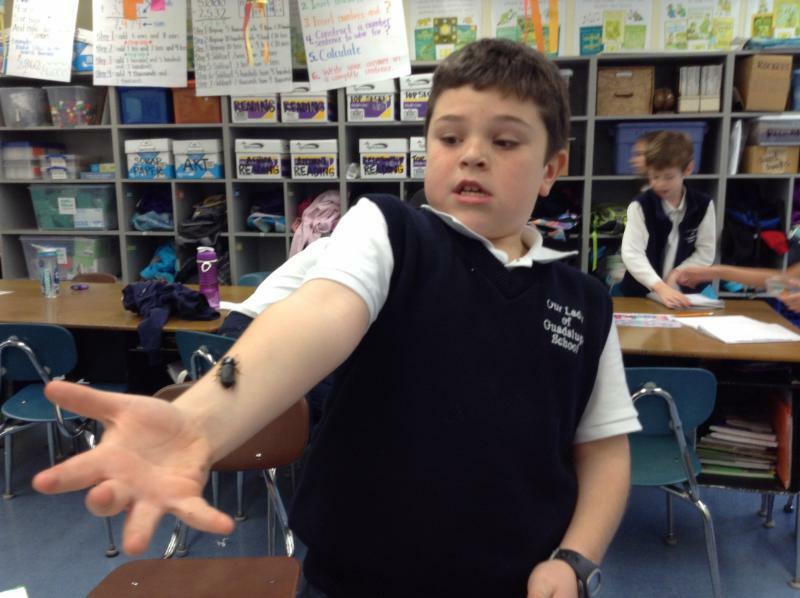 In this science unit, third graders learned about beetle body structures, behaviors and habitat. Have you ever wondered what it feels like to stand at an elevation of 29,000 feet? 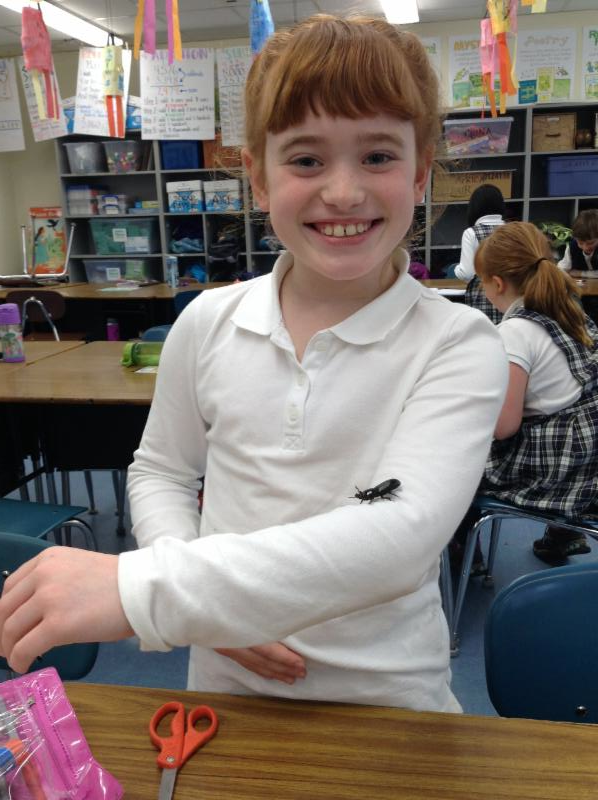 Third graders found out when they climbed Mt. 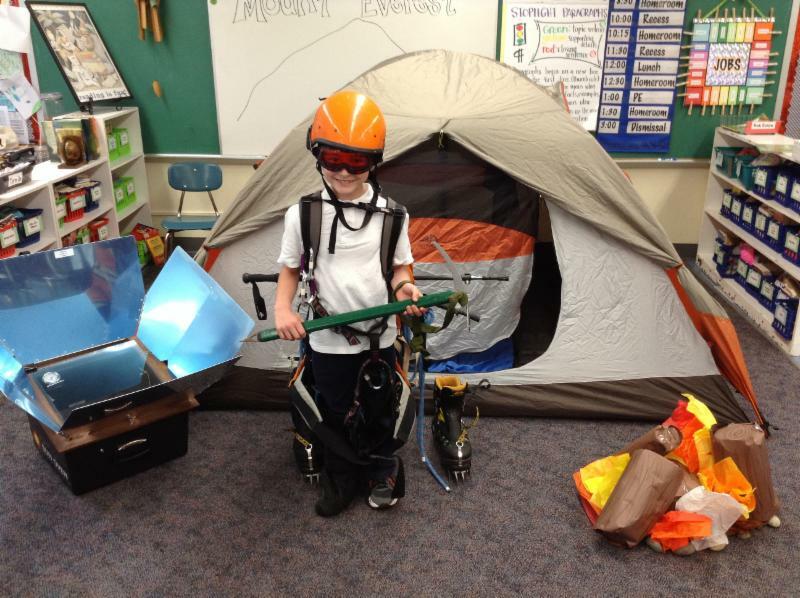 Everest in a simulation climb, learning that their success at summiting was dependent on equipment choices, weather conditions, their health status and overall grit! As we move through the final phase of our accreditation process, teachers continue to reflect, and examine closely who we are as a Catholic community of learning. We completed our Self Study, (in-depth investigation of student learning) by gathering and analyzing data, compiling input from OLG School shareholders, and thoroughly examining curriculum instructional practices. We shared our accomplishments, and set clear goals to further improve student leaning over the next six years. Our School-wide Learning Expectations – SLE’s – are referenced throughout our Self Study. They reflect the heart of OLG, and describe the desired characteristics of an OLG graduate. Seeks communion with God in the ongoing process of personal faith development. Examines the Catholic faith, traditions and doctrine and is able to articulate that knowledge. Recognizes the document on Catholic Social Teachings as a resource for responsible citizenship, as experienced through servant leadership. Demonstrates compassion, acceptance and respect as an active member of a faith family. Understands, integrates and applies knowledge in all academic subject areas. Experiences and incorporates the arts into his or her school life. Communicates confidently through the written and spoken word to a variety of audiences with creativity, clarity and an individual voice. Solves problems by using critical and creative thinking. Demonstrates and cultivates good organizational skills including effective study habits, time management strategies, skillful research and analysis, and project management. Recognizes similarities and differences in races, cultures and individuals, and participates in multicultural experiences. Resolves conflicts by understanding others’ perspectives, while applying critical thinking skills and effective decision-making models. Recognizes the value of all God’s creation and acts as a steward in service to the greater good of His creation. Recognizes the mental, spiritual, physical and emotional aspects of life. Evaluates personal strengths and weaknesses. Demonstrates honesty and integrity with regard to self and others. As a counselor, this last component is the most important when working with students. It is certainly a life-long endeavor for all of us – to understand the mental, spiritual, physical and emotional aspects of life! If we want our children to be confident and resilient individuals, we can help them identify and understand their challenges, recognize and firmly hold on to their strengths, and help them develop values and integrity that will benefit them and our world. The accreditation process has been a quest to the very depths of who we are, what we are doing, and where we are going. We’re an amazing community…parents, teachers and students, ALL striving to be: Faith-Inspired – Life-Long Learners – Active Members of the Global Community – Confident and Resilient Individuals. A heartfelt thank you to all of the Volunteers, Donors, Sponsors, Bidders and Attendee’s of the Sparkle Auction and Gala. To date we have raised over $126,000 in gross revenue! Receipts are in the mail, and any certificates or items that need to be picked up can be done at school Thursday and Friday during drop off or pick up. Alternative arrangements can be made with Laura and Laurie. Did you miss your chance to donate to fund a need? Did you forget to Buy a Spot at the amazing parties offered this year? Want to check out the black and white photos for sale one more time? They are all available online! The accreditation team is coming to our school March 24th – 26th and we want to show them what a hospitable community we are! Part of that hospitality involves providing meals and snacks during their three-day visit. We are gathering volunteers to bake, cook, and set up and clean up meals for our visiting accreditation team. This is a great way complete your commitment hours requirement for this school year. As you know, the deadline for commitment hours is April 30th. This is the last big call for volunteers before hours start accruing for the upcoming 2015/2016 school year. Help us welcome the accreditation team in OLG style! The volunteer hours are set up around times many of you are at the school for other commitments, and our volunteer crews are set up to be efficient and quick for minimal disturbance to the accreditation team. Do you work and need “work at home” volunteer hours? Consider baking and/or cooking a dish or meal! This is great way to earn hours from the comfort of your own kitchen. Prepare your dish at home and drop off at the school on the day it is needed. We need breakfast, lunch, dinner and dessert dishes and snack items. Do you drop your child off early at EDC or for zero period Spanish? Can you spare 15-20 minutes? Consider brewing coffee and helping to set up breakfast and snacks. Are you at the school mid-morning for recess duty or to help in a classroom? Consider volunteering to do mid-morning snack check and replenish consumed snack food and beverages. Are you at the school for lunch recess duty? Volunteer to be on the lunch team and help set up the lunch buffet and replenish snack items. Swing by a few minutes before school pick-up and check on our snacks one more time for the afternoon – it’s easy! Will you be at the school for a scout meeting or volleyball practice? Join our dinner team and help heat food and set up the meals and dessert. Click here to sign-up and be on our Parent Hospitality Team and earn double the hours! Opening Day is just around the corner and now is the time to mark your calendars to join others in cheering on the Mariners, eating hotdogs and popcorn, and playing the hydro races! It promises to be a great season. You can order your tickets by going to our parish website or pick up an order form in the back of church or at the parish office. $17 per person. Accessible seating is available. We need a few more volunteers to help host the Confirmation Reception with Bishop Eusebio on Sunday, April 19th after the 11:00 Mass. The response to this year’s Day of Service has been tremendous, with over 200 participants scheduled to help at seven sites in our community. Volunteers are still welcome to drop in the Walmesley Center to participate in projects to support the sick and homebound through writing cards, knitting and crocheting prayer shawls, and making prayer quilts. Volunteers will also be making placements and bulletin board displays for Mt. St. Vincent. All ages are welcome; drop in between 9:00 am and 2:00 pm! Contact Karen Fitton for more information. Find out the latest CYO News! A day of Free Dress will be given for students whose parents attended the State of the School! Please keep the Powell/Morrow family in your prayers. Welcome back, Mrs. Powell!